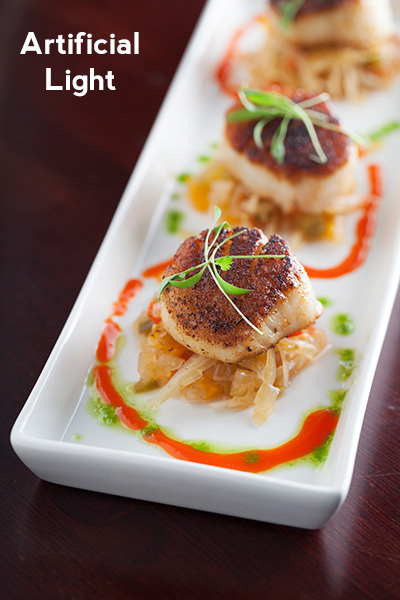 Have you ever been assigned to take pictures of a chef's creations in a restaurant? 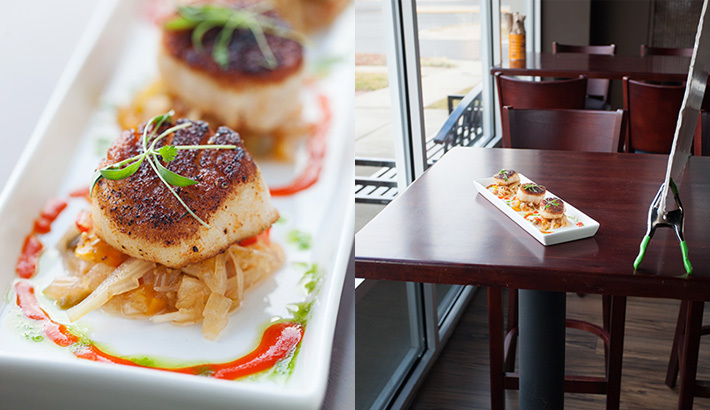 Photographing food on location at a restaurant is a very common assignment for a food photographer. 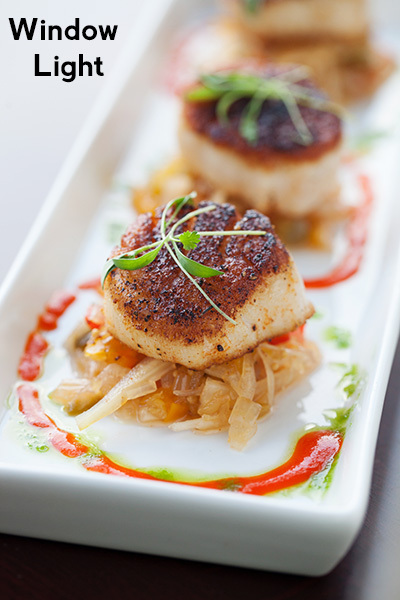 I have an editorial client that sends me to 4 or 5 restaurants every month to take pictures of the dishes. Through these assignments, I have discovered that most restaurants are not designed with the photography in mind. They will often be very dark and have a myriad of light directions and color temperatures. 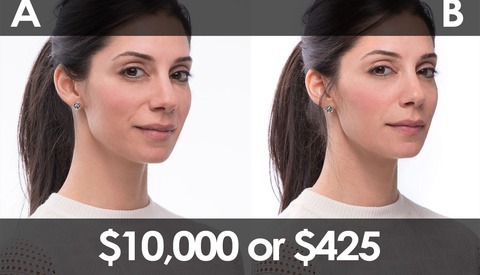 In these situations, you will have to bring your own lighting gear. There are other occasions when there will be large beautiful windows for natural light. If you have never been to the restaurant before, then you have to be prepared for both scenarios. Here is an example using two light sources with the same dish. When I first set foot into a restaurant, the first thing that I look for is a large window like what is pictured above. This is the best case scenario you can have when walking into a restaurant. Here is a picture that I took using this window as the key light. For this example, I backlit the dish and filled back in with a white foam board reflector. Notice how the top of the table has a white highlight from the window on it. Most restaurants will have wooden table tops that have a reflective finish to them. The large window light source is able to fill the entire table with a highlight. If you are working with a smaller window or a different table top material, this highlight may not extend the whole way. You can always adjust your shooting angle or change the direction you are lighting from to find the best amount of highlight for your image. Just keep in mind that most tabletops will be reflective. Here is a picture showing the lighting set up and the image. This is the simplest of set-ups that you can have. It is very quick to set up and I know that I will not be in the way of the staff preparing for that evening's service. Unfortunately, this isn't always the scenario. Here is a look at the other side of the restaurant. You can see that there is a wall on the left that blocks all of that beautiful window light. 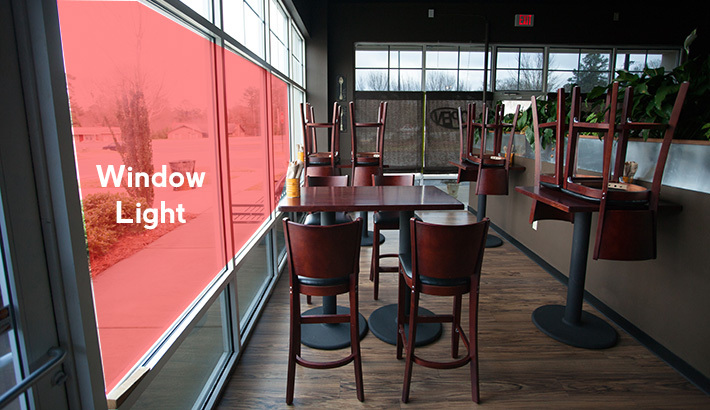 If you walk into a restaurant and there is no window or the window light won't reach over to the table, you will need to use an artificial light source. There are a countless number of light sources you can choose from. Whatever you do choose, remember that in a restaurant smaller is better. Before service, there will be waiters bustling around doing a variety of different tasks. This isn't a photo studio. Waiters and other restaurant staff aren't used to having a photo shoot going on before service and the last thing you want is someone tripping over your lighting equipment of cords. When shooting at a restaurant there isn't always a lot of time. The quicker that I can break down and pack up, the better. I usually shoot with a Canon 580 EX II, pocket wizards, and a Wescott 43" Apollo Orb as the light modifier. Here is the image taken with artificial light. Notice how the tabletop is a dark wood colored and not picking up a highlight like it was in the natural light example. For this shot, I have a different angle to my light and a different sized light source. The white highlight on the table to the right of the dish is from the dish reflecting off of the table. Here is the lighting diagram to go along with it. Notice how the part of the table that is right next to the light source has this bright highlight. If you moved the dish closer to the light source and re-framed the image, this highlight would be in your image. 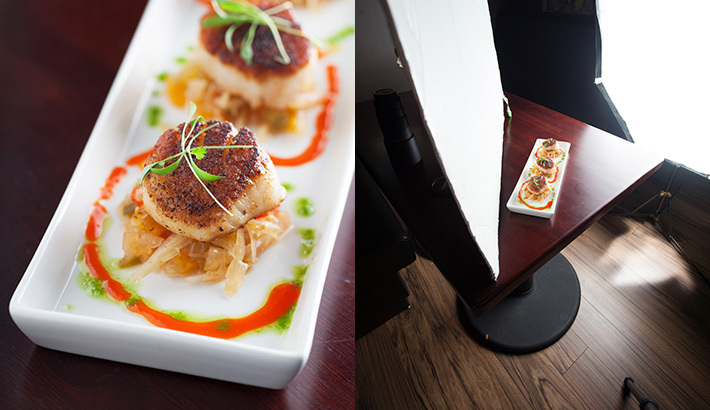 If you find yourself shooting food in a restaurant environment, make sure that you are prepared for both a natural and artificial light set-up. The Apollo Orb is a light modifier that I have found to work well for me, but it is not the only possibility. Whatever you do use, make sure it is small enough to stay out of the way of the hustle and bustle that occurs in a restaurant before service. For more tutorials and ways to improve your food photography, check of Issues 1-5 of photographing FOOD. You also have to work fast when on location as the food only looks fresh for so long. The same with the cocktails. Pretty soon the glass starts to sweat and you need a new one. Great post. I keep going back and forth on grabbing the Orb but I've heard horror stories about its build quality - care to chime in? 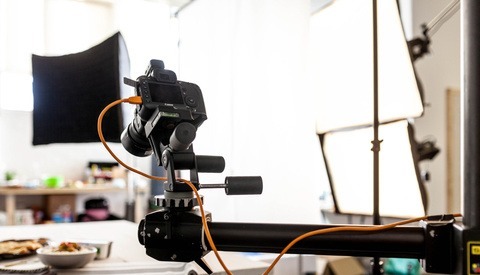 The Orb does have a short umbrella shaft that you have to pull through the center every time you open it, but its compact traveling size and quick set up have out weighed that problem. Occasionally the metal ends will come off the metal frame, but they can easily slip back on. It isn't perfect, but I have found that for the price and size it has fit my needs very well. Really appreciate the feedback. Reading reviews can make a person go crazy. I'm not looking for a gold-platted product, because I'm hard on my stuff anyways. I've been using the cheapo westcott umbrella setups and yea, they are cheap and flimsy, but they work just fine for 70 bucks! I really might take you up on the recommendation because I don't see anything in the price range that's similar. What's your go to lens for these beautiful tabletop shots? I love how simple your setup is and there's no need for additional props with your crop. I tend to use my 50mm at a low fstop but the DoF also seems a little too shallow and I can't get tight enough to get the desired result. My go to lens for food photography is the Canon EF 100mm f/2.8L Macro IS USM Lens. The 50 is great for wider shots, but for the tight and up close shots the Macro is the way to go. I haven't tried the Tamron or Nikon versions but I would imagine that they would yield similar results. Thanks for the tips! Exactly the information (at least the basics) that I was looking for. What a brilliant post! I was on an assignment to do restaurant marketing for a local Ethiopian Restaurant. It was before I knew the power of my Canon T4i, and did all my photo shoots with a point and shoot Canon EOS. I wish I could go back in time, but I don't think I did a bad job - I look at your photos and remember all the dark shiny wood and that one window I always wanted to sit at for our weekly meetings where I would capture different dishes that were unfamiliar to our culture. 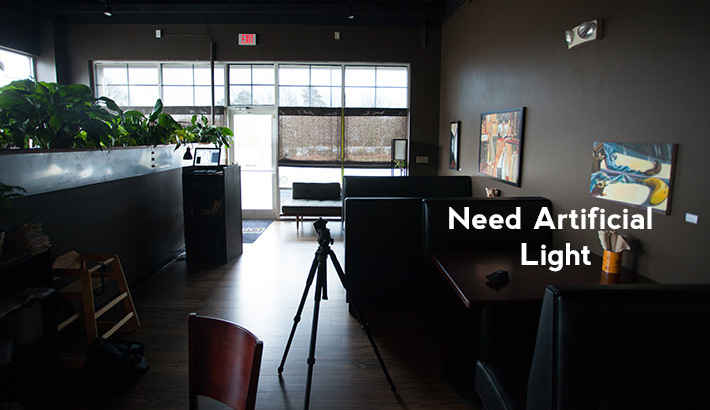 It was a true lesson in lighting and I loved working in the restaurant environment. Maybe someday I'll have another assignment. Any suggestions for setups when there's too much light? I recently had a job in a restaurant where they insisted on scheduling the shoot for afternoon when direct sunlight was blasting through the windows. I ended up having to box the food off with foam core and large diffusers. Sounds like you did all you could do. I've had to do the same thing. Using a large diffuser right up next to the food helped a lot with the harsh shadows. Then bouncing the light back in with some white foam core, or reflectors, to fill in the shadows. Taylor, what kind of continuous light did you use inside the softbox? Thanks.